Occasionally people discover spare machines, & want to rebuild them, so I'm putting virtually all info on the net, including distribution tape & other binaries such as gcc & gdb, + scs reconfigurable kernel kit etc. If you discover one of these extremely rare boxes, don't throw it out - you can now reinstall it instead. My FTP Archive: ftp://ftp.berklix.com/pub/symmetric/ I stopped merging & reducing & re ordering it around 2006.05.11 there's still duplication of some components. Several index files exist there in capital letter names. Somebody else is welcome to use tools like find & md5 & my own cmpd to further reduce it please. Private - offline stuff for JHS only. so rdist will fail in direction this host to modern host. If Symmetric/modem link is at 38400, transfers fail, 9600 is OK.
/usr/bin/local/kermit-5a has been compiled, but not tested. gnu/taylor uucp & ftp binaries (slip included) exist. Find-2.2, GCC-1.40, Ghostscript-2.3, Make-3.60, Zoo-2.1. Timezone:   PDT - (as reconfigurable kit to permit MET has bad tape driver). 2M RAM, soldered, not socketed, no expansion room. 4 Serial, (top clock speed 38400 is limited pair wise, ie no 38400 on tty0 & 19200 on tty1), supports SLIP. Tape Drive: SCSI Cassette (not cartridge), 60M drive, SCS driver uses it as 50M). SCSI external connector. && Means same on both Symmetrics. DR Pin 3 to near a big hole. My 33c95 is socketed, Chucks isn't. The 2 adjacent DIP headers appear to be for 19200/38400 baud rate switching. presumably 1 DIP for /dev/console & tty1, other for tty2 & tty3. | |  |  ^^^^     Year and month (more likely year & week). | |  ^       Flow code (ie which production line & factory). && RAM  4 * 16 *  KM41256-15 6382 koreaA    No Sockets, No room for more. NEC D4016C-2 8634B9206 <-- is this also on scs board, or just on the wd board? even though SCS driver only use 50M. he sent me a manual. Head Assembly:   TEAC 14769360-00 7819 C, Seiko Epson Corp.
(Write pre-compensation cyl. (ST506 only)). 12v 1.8a 5v 0.9A     Total flaws 53 Surface 4 has 18 flaws. rs232 From Manual: Serials are configured like DCEs (Modems). Internally DCD 8 is wired to DSR 6. Console DCD is wired active. Available: 2 TXD In, 3 RXD Out, 4 RTS In, 5 CTS Out, 6 DSR Out, 8 DCD Out, 20 DTR In. I noticed lowered performance when hanging on a long 30 to 50 metre serial cable which sometimes didn't have a laptop connected at far end: ps then showed gettys with random noise as login name, simple solution was to put a terminating plug on far end of serial cable when not connected to a laptop. This leads to question of if Symmetric used a cheap 7400 series 5V chip, or a more expensive 12 differential chip ? I don't know. /* * Arguments to reboot system call. I think the Maxell CS600HX are 150M tapes. the capacity is to change the block size in the driver. tape 12v 1.6A max steady (presumably when streaming), more at start. tape  5v 1  A max steady (presumably when streaming), more at start. micropolis 5" disc 12 2A average 4.3 @ start. micropolis 5" disc  5 2A average. cpu (by observation) 5V 70mA, 12V 50mA, -12V 45mA. Signals on flop interface are 0=active. because WD controller needs to double frequency. Pin In |Chinon 3.5" (jhs)   | NEC 3.5" (sja)      | NEC 5.25" (sja)    | Sym. if an internal floppy is fitted. disk "A" or "B") and the parallel printer. present the results herein. May it be of some use to someone else. on a 'scope. The assignment given above was chosen arbitrarily. #3. Pins 6-9 and 14 seem "unused", though they do have +5 "pull ups" on them. can be read and written, and Minix boots and reads /usr. FLOPPY DISC RIBBON INTERFACE CABLE WITH TWIST As purchased by JHS 9-90.
and a twist between one set and the other 2 sets. next 7 are twisted in a group, rest are straight. To accompany valid, dd, symmetric, unix msdos debug scenarios. reads both head 0 & 1 of track 0, before progressing to track 1.
first high byte) Reference: Advanced Msdos by Ray Duncan, page 166. IP's PC-AT clone wrote a 360K floppy readable with /dev/rfdE0. Kernel size: 204,800 bytes (inc. ethernet). Extra Features from jhs: Kermit, gcc, gnu/taylor uucp, kermit-5a-386bsd, various other own C programs, + moved all bins from /etc/to /sbin, leaving just a few essential symbolic links. /usr/src/local/*. Little Smalltalk 3.04. Zmodem (sz,rz), Egrep, Gas, Gas-1.38.1, Gdb-3.5, Grep, Install, Tar, Texi2index, Texi2roff Objdump, Patch-2.0.12u4. /sbin contains all the system binaries jhs removed from /etc. /usr/local/kermit works ok (to GUUG) If Symmetric/modem link is at 38400, transfers fail, 9600 is OK.
Directory of my programs such as timesheet, valid etc. Additional FSF GCC (1.40 (& maybe 1.42)) compiler for it, that's much better than the native compiler. (I can now easily put this on an via ftp site if needed). SCS Inc. reconfigurable kernel kit for it. Provided by 386BSD & BSD4.2, Used by uucp-1.04 code. February, 1987, by Paul Vixie (dual!ptsfa!vixie!paul @ ucbvax.Berkeley.EDU). requested, otherwise, I will not open the factory seal on the drive. single or multiple files from an image backup tapes. Matt Neely ne99mb70_ERASE@ACS.WOOSTER.EDU (no such user @ 2003.12) There's a few other owners somewhere in my archives. Salam of www.vintage.org has a 3rd in the collection of his museum associate, as of 2001.04. Brenda Walker walker _ERASE@ volcano .net wrote 24 Jun 2001: As sister to Bill Jollitz the designer of the Symmetric 375, I too have the machine and know of one other. Hans-Peter Nilsson hp _ERASE@ bitrange com Maybe interested in gcc or something, if I can put it on Internet. Bill Studenmund wrstuden _ERASE@ sun510.nas.nasa gov for ld.old ? bdale @ 2003.12 has just the PCBs, & will sub. the mail list. Paul Vixie: Much experience of SCS, but now sold his machine to chuck. not enough, needed 4A, so he upgraded to a 5A supply. he said he only has 1. The manufacturer, SCS (Symmetric Computer Systems) Inc. is long defunct. 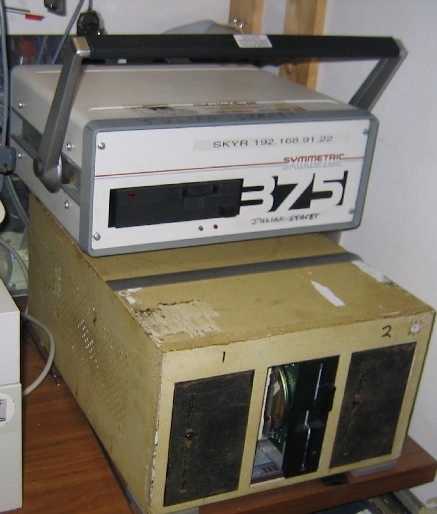 It was named the 375, in honour of the VAX 750, & SCS Inc. adverts promoted it as "Half A Vax"
New price was: $8000 / $9000 with Ethernet + built in tape, + VT220 clone + cheap nasty matrix printer, or $5000 with built in floppy, but no ether, no vt220, no matrix. They were exhibited at Vintage Computer Fest Europa, 1st May 2000, & 28&29 April 2001, & 27 & 28th April 2002 & May 3 & 4 2003. The ethernet machine was exhibited again in 2006.
they will apply for an export licence for me. implies get ether free if all prices are fair, & want lpr + vdu. 4.3 still beta test, they are doing scsi research to get a more general driver. him (whoever) to ring back. Lynne Mesner 9.40 am wed 12 dec. 12.30 ie 30th dec. I get 4.3 free later, (other customers pay $1K) my machine on test, ok except tape drive.